Our Single Face Corrugated Paper Rolls provide great protection for lots of items of furniture such as cupboards, wardrobes etc. It is perfect for protecting chair legs & table legs during house moves or during commercial deliveries. Glass items can be protected from scratches during transit and its flexible nature allows it to be wrapped around CD’s DVDs or as something that is used widely in the arts & crafts industry to protect delicate & fragile goods. It is easy to cut the required amount from the roll and it is increasingly popular with clients not wishing to use plastic bubble wrap in their distribution process. The fluted paper works extremely well and allows customers to produce parcels to protect small items before posting. The smooth outer side allows address labels to be affixed as they would be to a box. 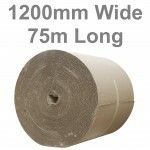 Our corrugated Cardboard / Paper Rolls are available in various widths to suit your own particular needs. We offer same day shipping and next day delivery, so you can start using this environmentally friendly product almost immediately.